A Christian perspective on the holiday. Learn about its history as well as what the Bible say about freedom and independence. Remember that Jesus is the Reason for the Season. Lots of different pages - Wisemen page, Kids page and a Gingerbread page to name a few. Christian-oriented page with history, scripture, and links. Page reflects on the King holiday from a Christian perspective. Reflects on the holiday from a Christian perspective. Discusses the holiday from a Christian perspective. Contains history, links, and biblical information about the holiday. Tells about the holidays history and considers the day from a Christian perspective. Saint Patrick was a Christian missionary to Ireland. Learn all about the holiday. Prayer Warriors, web design help, comfort and encouragement, bible studies and how to be an internet missionary. Rapture, news, mark of the beast, Jewish feasts, verses and thoughts and opinions of general issues. Devoted to the Christian observance of this traditional Jewish holiday. Includes history, related Scripture passages, and links. Provides historical information and explains what common Easter symbols mean. Biblical perspective on the day along with history and a list of the U.S. Secretaries of Labor. Questions whether Halloween is really just another 'harmless holiday.' Written from a Christian perspective. All about the U.S. holiday, along with the Pledge of Allegiance, definitions of what 'flag' means, and history of the observance. History, legends and customs of the holiday taken from the World Book Encyclopedia 1998. Explains how to share the story of Christs death burial and resurrection using 12 eggs. All about Flag Day (U.S.), with the Pledge of Allegiance, definitions of what 'flag' means, as well as the history of Flag Day. Quotes about women, many links to such sites as women authors, Christian women, women in the Bible, biographies, educational links, Victorian women links, international women of history. Provides information about the holidays history and includes Bible verses about trees. Hatha, Iyengar, flow, restoratives, meditation. Offers support and information for homosexual youth, and advice to friends. Holiday stories from around the world. Interpretations of the mythic tarot, which is based on Greek mythology. Lists meanings, guestbook and profile. Includes personal information, Backgammon resources, a page on genetic algorithms, an art page, a programming page and information for XyWrite users. Personal page that has a history of Valentines Day and a link to a commercial graphics page. welcome to jamie and abbys home page. a kansas city police web page. If the business hours of Annies 4th of July Page in may vary on holidays like Valentine’s Day, Washington’s Birthday, St. Patrick’s Day, Easter, Easter eve and Mother’s day. We display standard opening hours and price ranges in our profile site. We recommend to check out annieshomepage.com/fourth.html for further information. 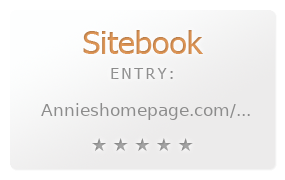 You can also search for Alternatives for annieshomepage.com/fourth.html on our Review Site Sitebook.org All trademarks are the property of their respective owners. If we should delete this entry, please send us a short E-Mail.